A Fun-Filled Night with the Girls! If you and the girls are looking for a huge night out on, then this is it! We take care of everything and provide an English-speaking guide too, so that you can focus on having the best ever hen do in Barcelona. You and the girls will get the party started at your high-quality, centrally-located restaurant. Your delicious three course Spanish meal with take you on a gastronomical journey through Spain, and can be accompanied by unlimited sangria. This will really get the party going! Now, what better way is there to arrive a nightclub than in a luxury hummer limousine? 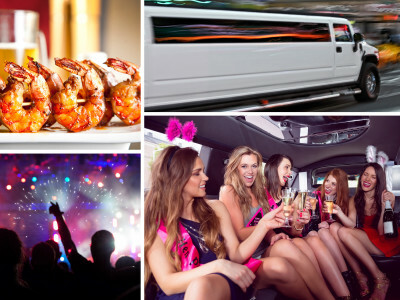 The luxury vehicle will get you pumped up as you can choose the hen’s favourite songs as your cruise through the city towards one of Barcelona’s hottest nightclubs! Your night will really get going when you arrive at one of Barcelona’s best nightclubs along with all of your friends! If you and the girls are a big group and are more than 12, your 1 hour ride will be split into two 30 minute journeys so that everyone gets their share of the fun! If you prefer, you could also arrange a second hummer for an additional cost – get in touch and we can work with you to figure out the solution that’s best for you!